There are hikes where pictures don't come close to representing the true beauty of the views, and this is one of them. 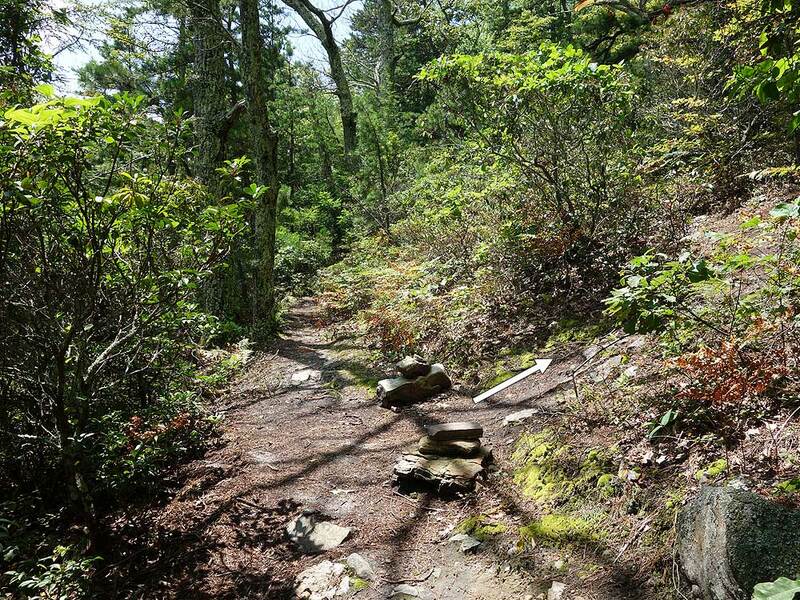 A more strenuous hike than you'd expect for a 5.4 mile 1,960 foot ascent, the hike has some unrelenting inclines and a steep final spur trail up to Chimney Top. 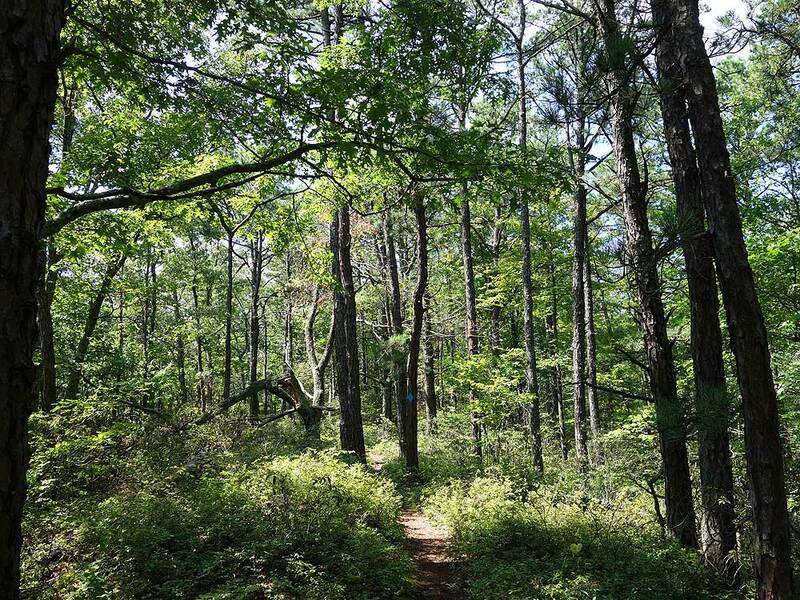 You'll feel like you've hiked closer to 10 miles by the time you get back to the parking area. 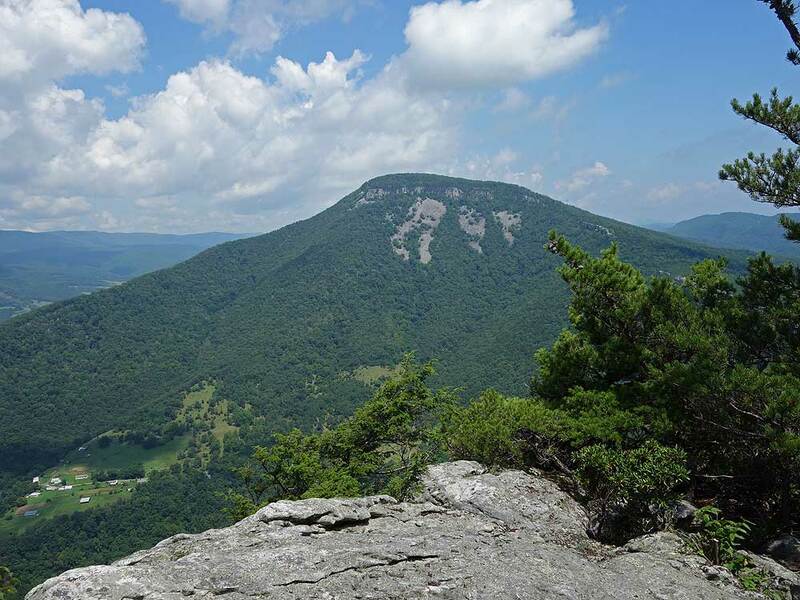 This hike is not nearly as popular as the views and camping deserve, so get out there soon before the word gets out! 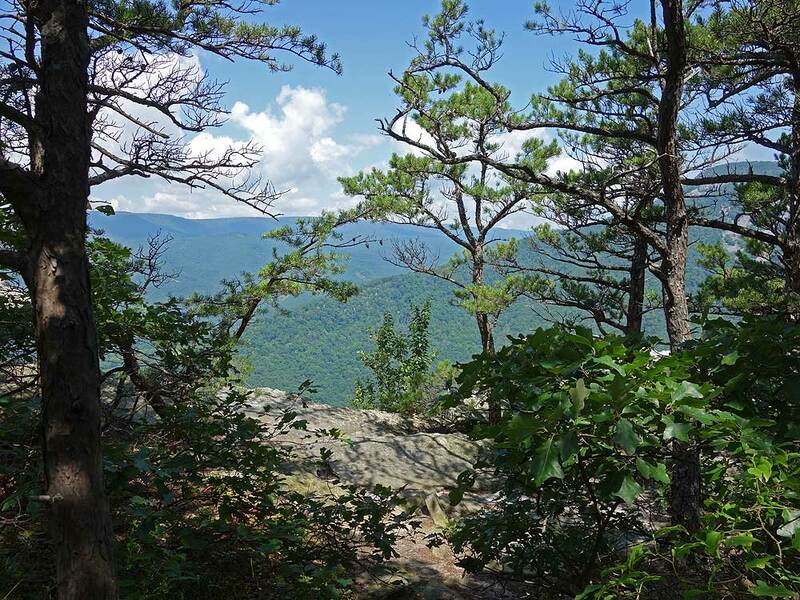 After passing through a forested area the hike enters more open pine stands, then arrives at the first overlook with a view down to the North Fork of the Potomac River. The rock wall here, visible from the valley, has overlook after overlook for nearly half a mile, so don't be concerned if you get to the parking area and see a lot of vehicles, you're still almost guaranteed to get an overlook to yourself. 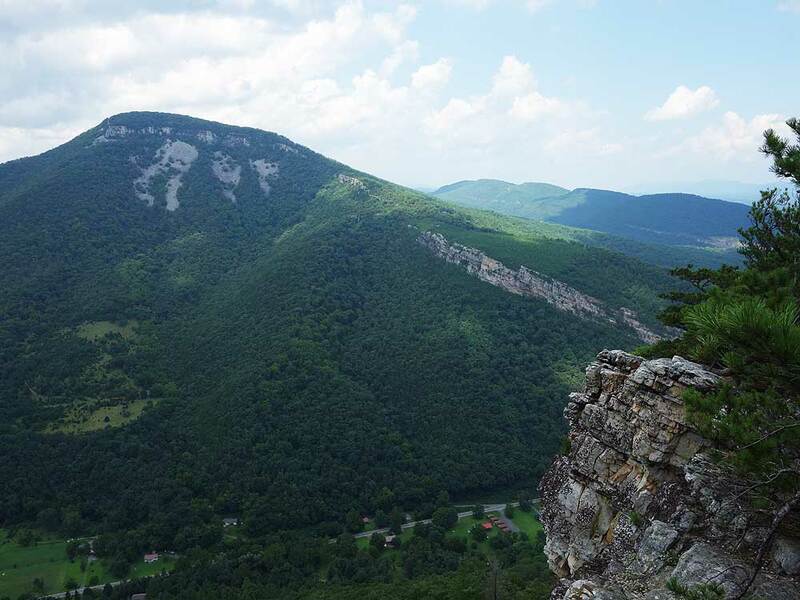 The Chimney Top hike is part of the northern section of the 24.7 mile North Fork Mountain Trail traverse hike with this area having the greatest density of overlooks. 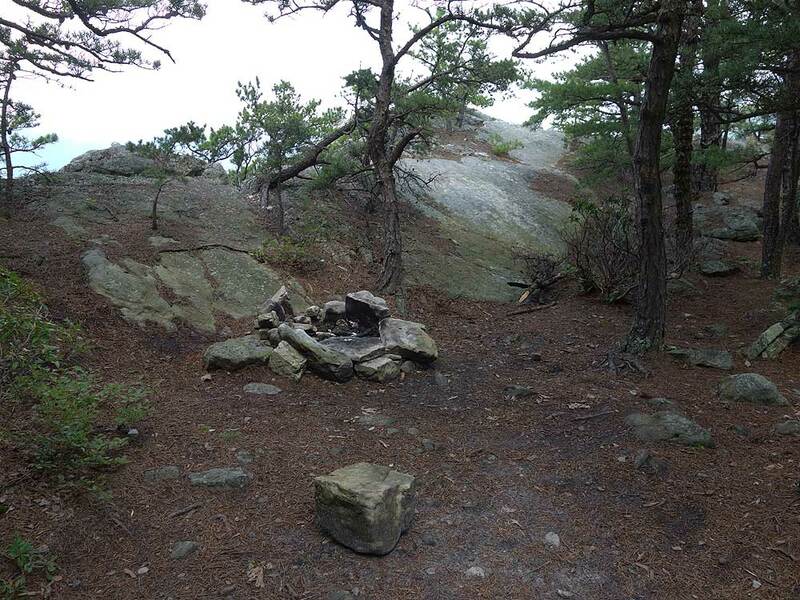 If you are considering doing the Chimney Top hike as an overnight backpack there are three good campsites. Two along the ridge wall, and the other at the Chimney Top summit. Keep in mind that there are no water sources on this 4.5 mile out/back route and you will need to carry water up with you. Mile 0.0 – From the parking area pass the information Kiosk and start up the blue triangle blazed North Fork Mountain Trail. 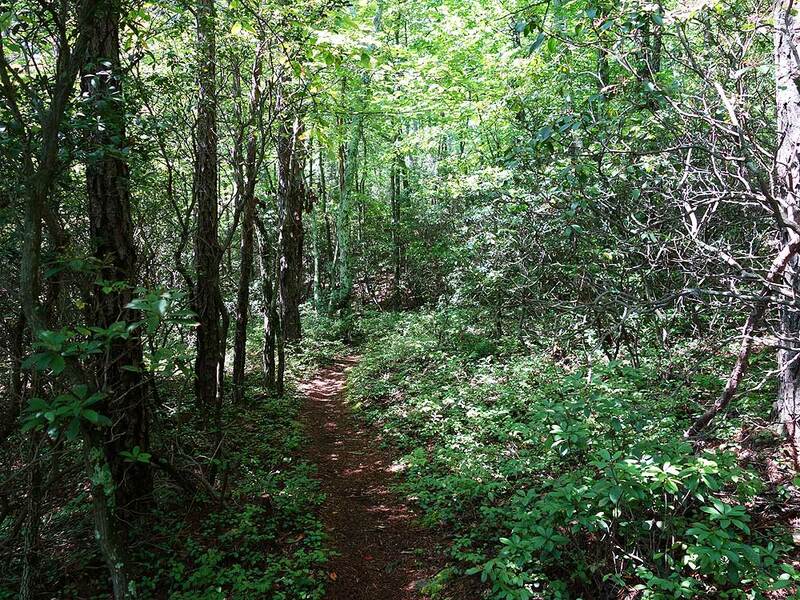 The trail will wind upwards on the mountain through a forested area with good cover. Pine is also located along the trail which makes for a nice layer of needles to hike on. 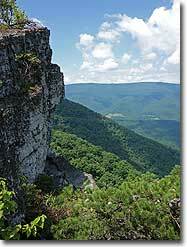 After climbing for 1.55 miles the trail makes its final switchback before the first overlook on the ridge wall. The trail will open up here with less cover. 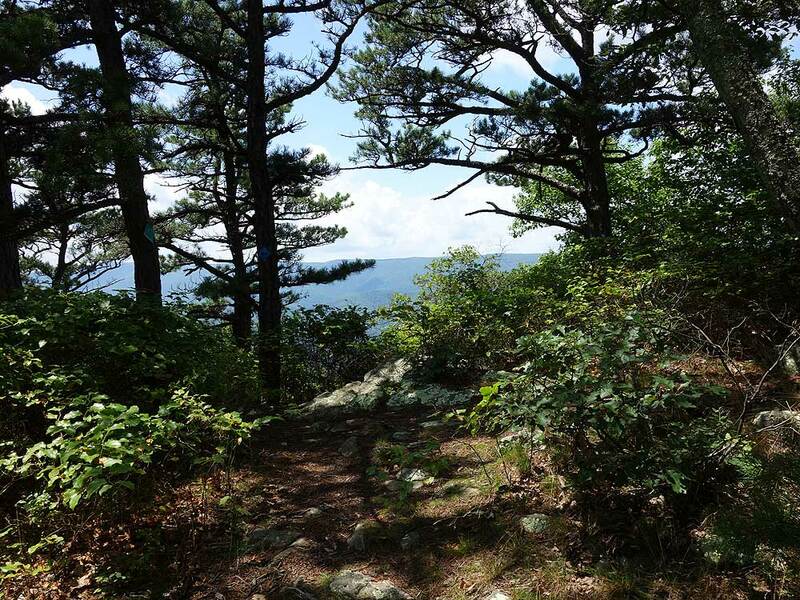 Mile 1.74 - Turn right onto an unmarked side trail to the first overlook on the rock wall. 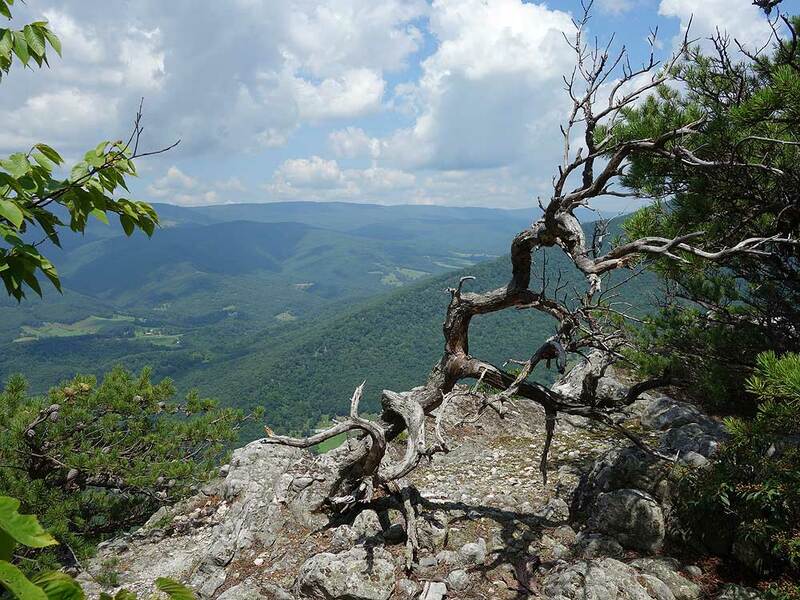 This is the best overlook on the wall and has spectacular views into the valley of the North Fork of the Potomac River, New Creek Mountain, and the Dolly Sods massif. Continue uphill along the ridge wall as the trail steepens. Mile 1.84 - Pass a campsite on the wall. Mile 2.02 - Pass a second campsite on the wall. 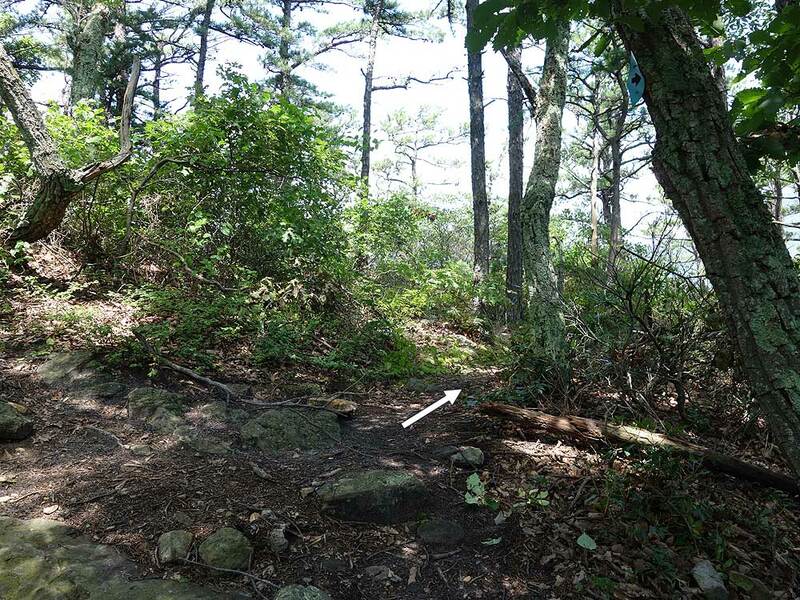 From this point the hike increases in steepness for the 0.4 miles to the Chimney Top spur trail intersection. 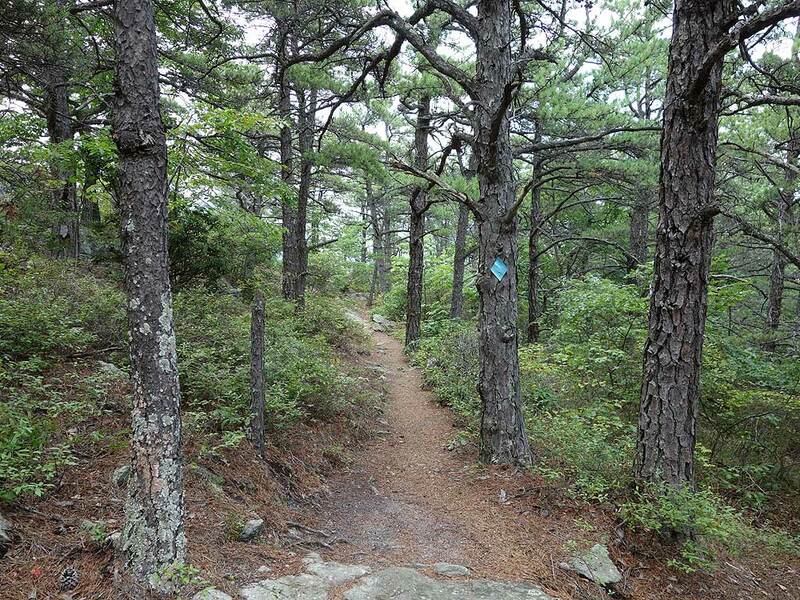 Mile 2.5 - Turn right uphill on the unblazed Chimney Top spur trail. The spur trail is the steepest portion of the of the hike. 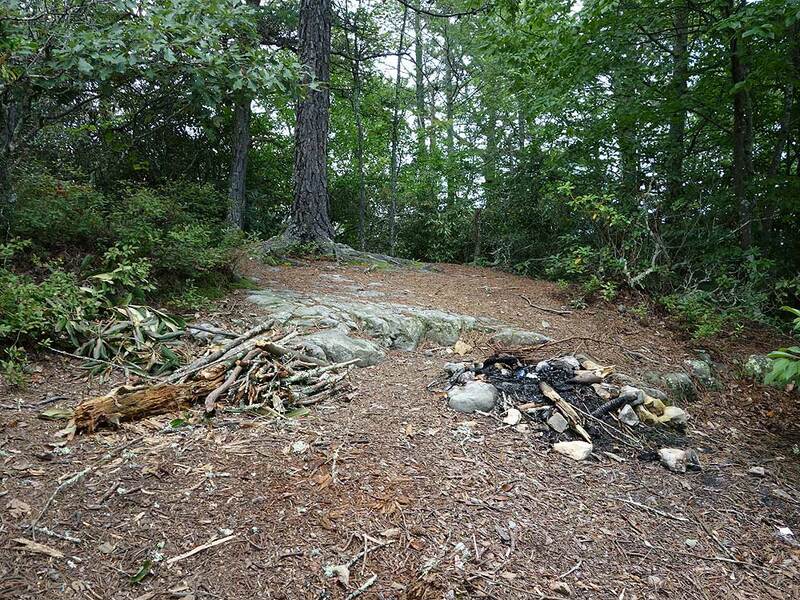 Mile 2.7 - Arrive at the Chimney Top summit campsite. 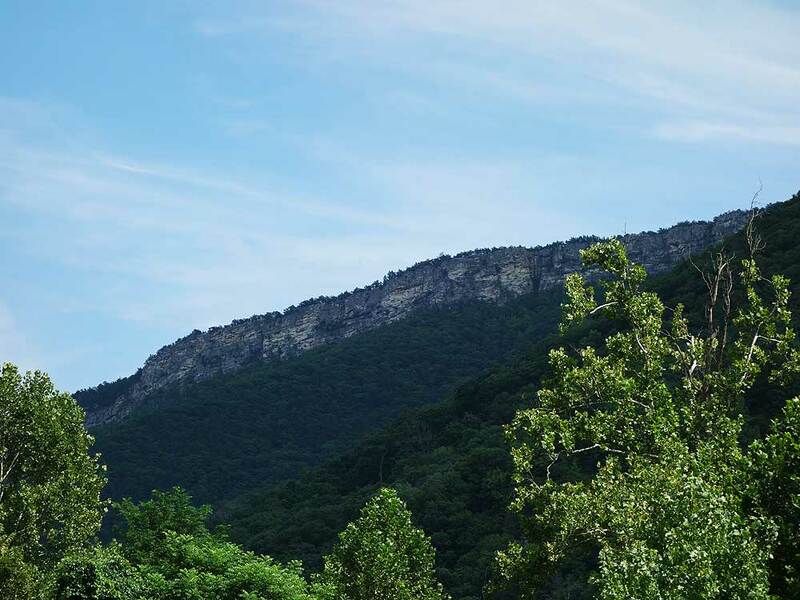 Pass through the campsite to see Chimney Top with sweeping views of the valley. There are multiple viewpoints from the summit of the valley below. Use extreme care if you decide to climb around the rocks. A fall here will be fatal. 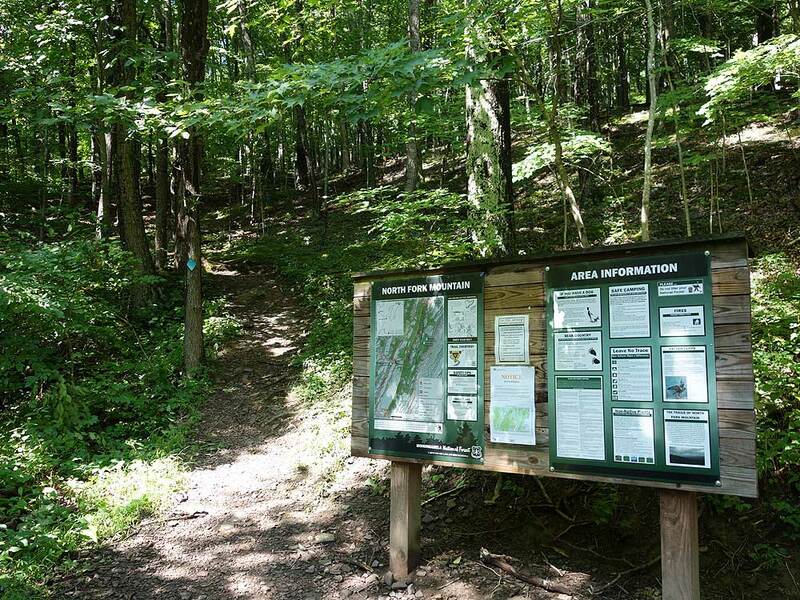 Return down the steep spur trail and retrace your route back to the parking area. Mile 5.4 - Arrive back at Smoke Hole Rd. and parking area. I completed this trail on a cold windy January morning. I was on a solo hike starting at 8 AM and saw 2 pairs of descending campers going up and a single ascending hiker with her dog on my way down so the solitude rating seems accurate. 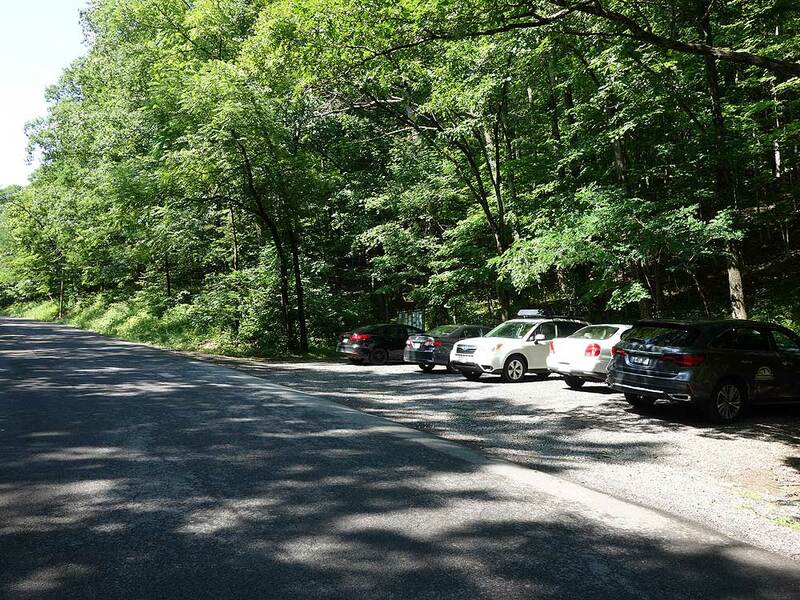 The parking lot for the trail head is tiny (maybe 6 cars max) so you may have to park further off road. 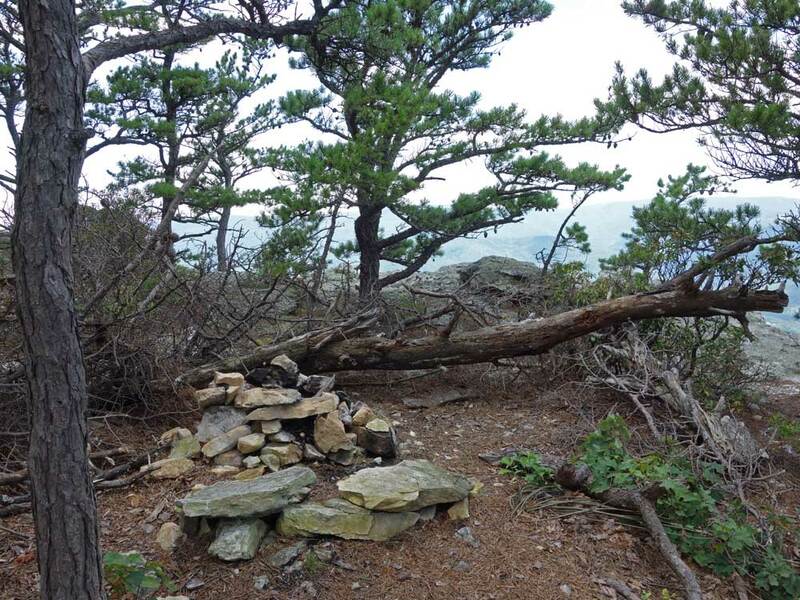 The bulk of the hike is very straightforward, easy to follow and marked with blue blazes. 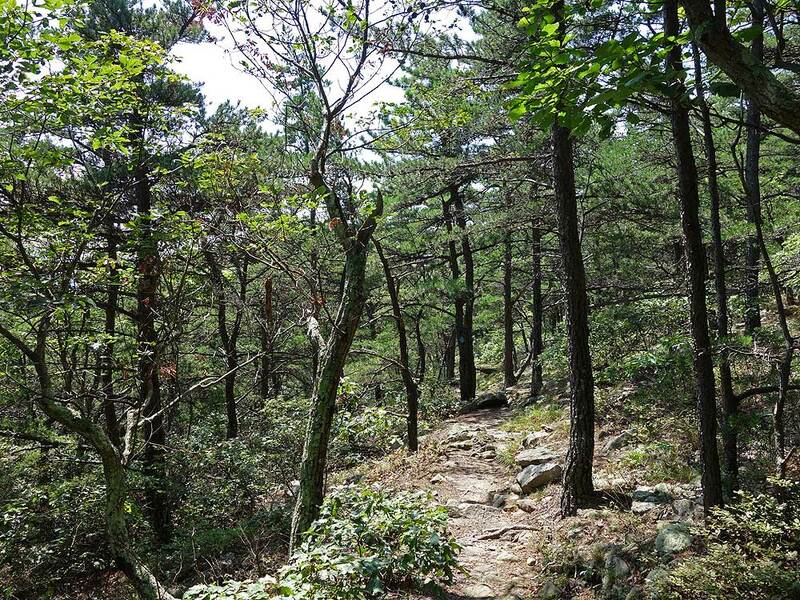 The spur trail near the peak is much more difficult and ran me out of breath. However, the view at the top is more than rewarding for the efforts you will have to put in to make it to the end. The winds at the top are strong and deafening the cliff face of the hike faces Westward so I recommend starting the hike around noon so that the sun shines against the cliff in the afternoon. Unfortunately, I went during the morning so the cliff face just appeared very dark and gloomy. A fair amount of prickly shrubs also obscure parts of the hike and lot of rocks are moss-covered so make sure to dress accordingly. I was able to complete the hike in 3.5 hours total including breaks and picture taking. 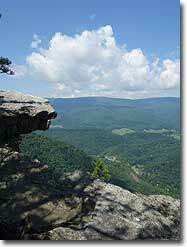 Overall a great hike with varying difficulty and a rewarding vista. Let me start off with the bad news. The rating for solitude was clearly before this hike was listed on hiking upward. I started on a freezing saturday in October and the mountain was packed with people all throughout the night and into our departure on sunday morning, including a rowdy crew enjoying a few adult beverages, some slackliners, a church group of more than 30 people and a few families with kids. Also, just being a bit of a stickler here, the difficulty should be higher. 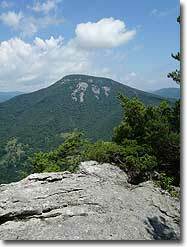 It has the same 4 stars that humpback rocks has and is far more difficult. I actually believe it is on par with the Priest hike in terms of difficulty. But more importantly... Those views. Totally worth it. Every last bit of it. Made me want to invest in a better camera because I am sitting here looking at my pictures and they are amazing, but still can not even begin to do it justice. Did this on a cloudy day in August just as the directions read. Thoroughly enjoyed it - even with obscured views due to weather. Headed back tomorrow - plan on hiking further along the ridge and then back. Highly recommend this hike for any skill level. Since I was hiking back from Chimney Top and passed Hiking Upward on their way up, I guess I'll be the first to review this hike. This is my favorite hike. 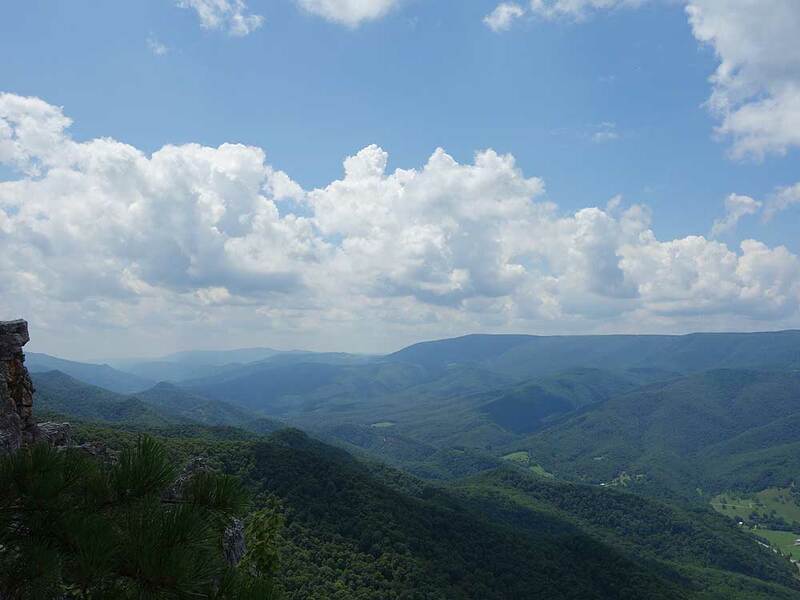 The views are great as soon as you hit the ridge about a mile from the overlook, and make it very tempting to conclude your hike there. 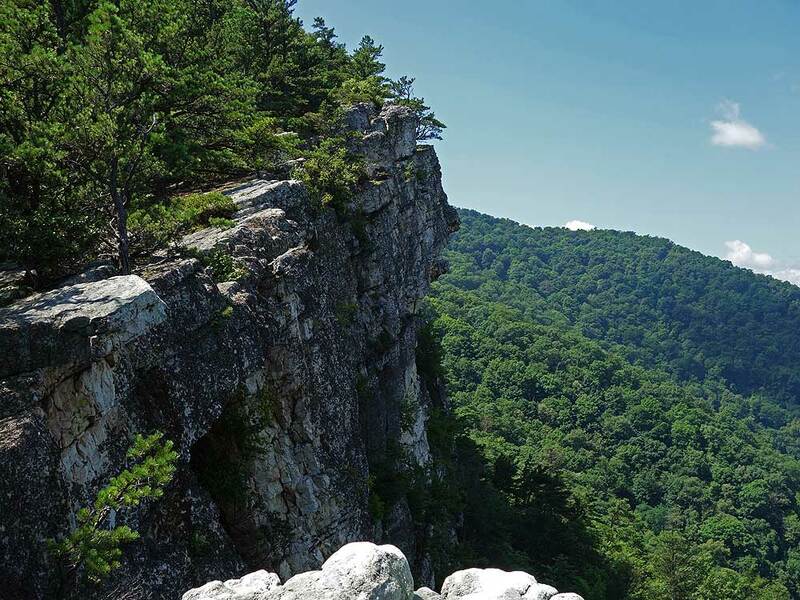 Once you get to the Chimney Top area, the view is spectacular, only there is a trail in the bushes that takes an easy climb down and then up to get you to the top. 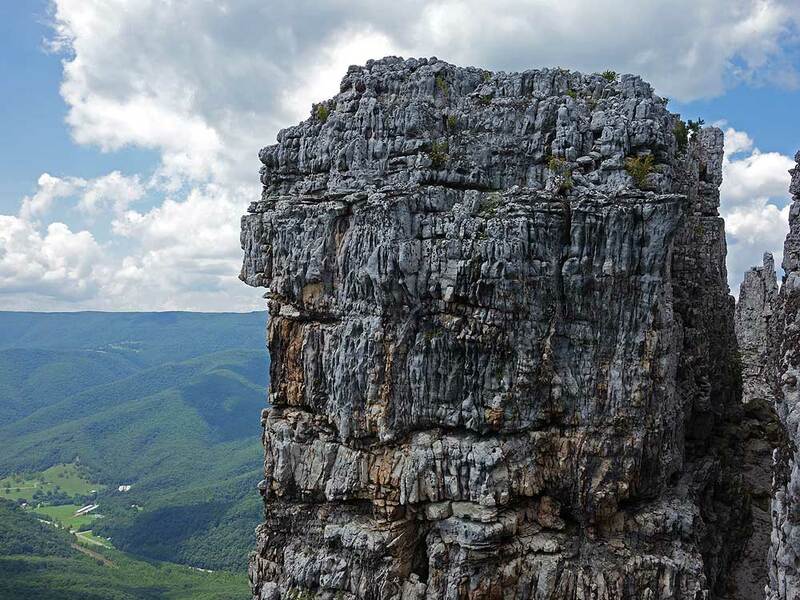 The view from the top is exceptional, an almost unobstructed 360°, set on bleached rocks that are more reminiscent of cave formations or a lunar landing. 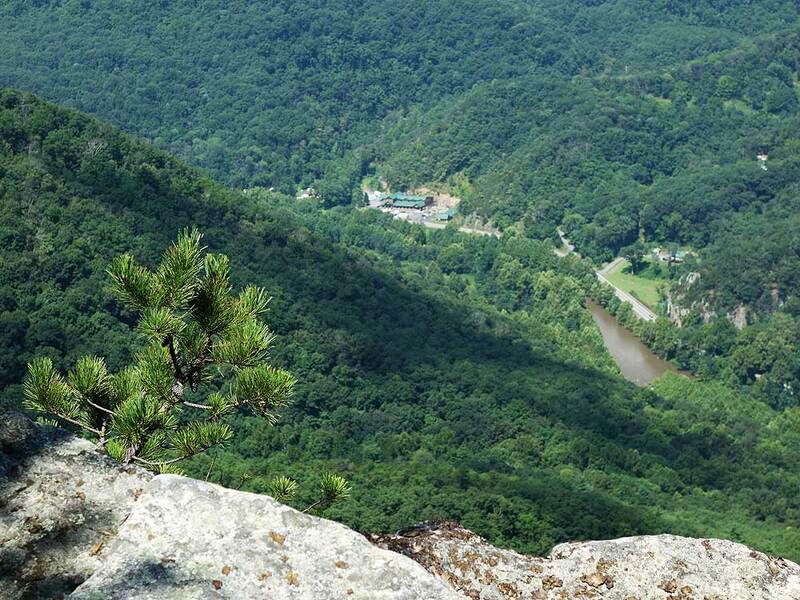 Make sure you check out the geo-marker, and the views to the north and south at this overlook. The way you'll know you're at the summit is if you see a huge cairn on a rock formation you can't climb to. 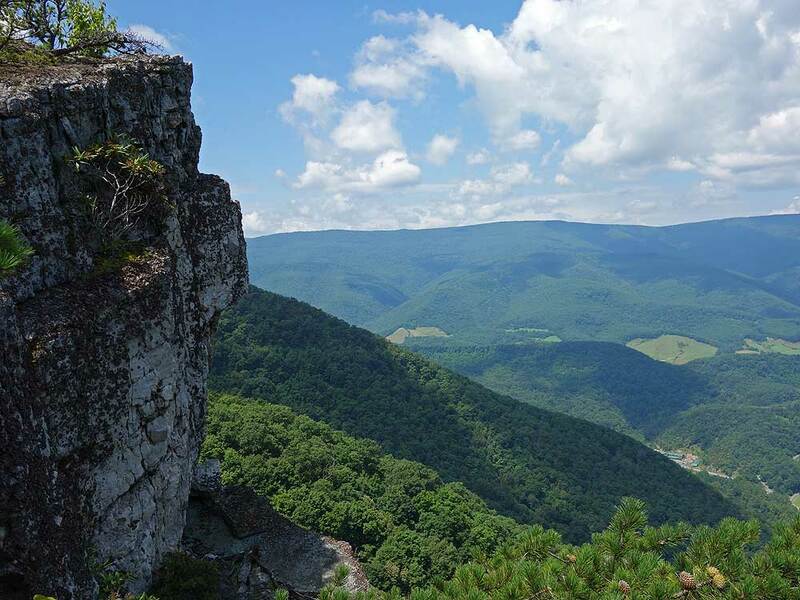 Chimney top's views are the best in West Virginia, mainly for their uniqueness. 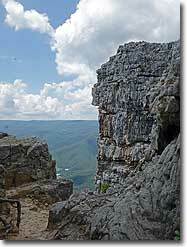 You have the 360° views Spruce Knob should have, a wall similar to the Endless Wall trail at New River Gorge, the valley views of Bear Rocks, all set in a terrain package that is to me unique in not only West Virginia, but also Virginia and Maryland. This hike is not for someone out of shape. It may only be about 2000 feet in elevation, but it's the way the ascents are that make it harder than a hike of equivalent elevation. The last portion up to the chimney top area will leave anyone huffing and puffing.